Roaring Brook Press, 9781626728141, 336pp. 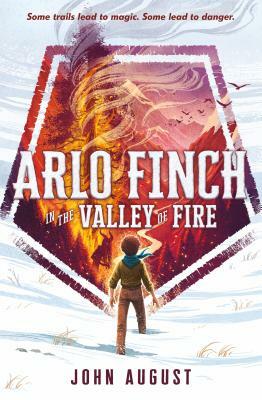 Arlo Finch in the Valley of Fire is the first book in a spellbinding fantasy adventure series by screenwriter John August. Some trails lead to magic. Some lead to danger. As Arlo looked around, the walls of his room began to vanish, revealing a moonlit forest. Only his bed remained, and the frame of his window, through which he saw the girl. The world on her side of the glass was sparkling with silver and gold, like a palace made of autumn leaves. Arlo Finch thought becoming a Ranger meant learning wilderness skills, like camping and knots. But upon arriving in the tiny town of Pine Mountain, Colorado, Arlo soon learns there's so much more. His new friends Indra and Wu teach him how to harness the wild magic seeping in from the mysterious Long Woods—a parallel realm of wonder and danger. First he must master the basics, including snaplights, thunderclaps and identifying supernatural creatures. But Arlo Finch is no ordinary Ranger, and this is no ordinary time. A dark and ancient force is sending threats into the real world . . . our world. Through perilous adventures and close calls, Arlo is awakened to his unique destiny—but the obstacles he faces will test the foundations of the Ranger's Vow: loyalty, bravery, kindness, and truth. Born and raised in Boulder, Colorado, John August earned a degree in journalism from Drake University and an MFA in film from USC. As a screenwriter, his credits include Big Fish, Charlie’s Angels, Charlie and the Chocolate Factory, Corpse Bride and Frankenweenie. His books include Arlo Finch in the Valley of Fire. In addition to his film career, he hosts a popular weekly podcast, Scriptnotes, with Craig Mazin. He also created the Writer Emergency Pack, an educational storytelling tool that was distributed to over 2,000 classrooms in partnership with non-profit literacy groups like 826LA and NaNoWriMo. John and his family live in Los Angeles.